Oh, man. I had so many things bookmarked to share here for Halloween. Lesson learned that I should never wait this long into the season, because things sell out so fast! Have I mentioned that I love Halloween? I do. I think it might be my favorite holiday. Here's a selection of some things I love for this October 31st. a. A fun & festive Trick or Treat banner. b. Handmade treat buckets. Love these!! c. Handmade, scary chalkboard centerpieces. d. Check out these handmade ceramic tombstones...along with all the other great stuff available from this artist. e. I'm obsessed with vintage chenille Halloween ornaments. Martha shows you how to make your own here. 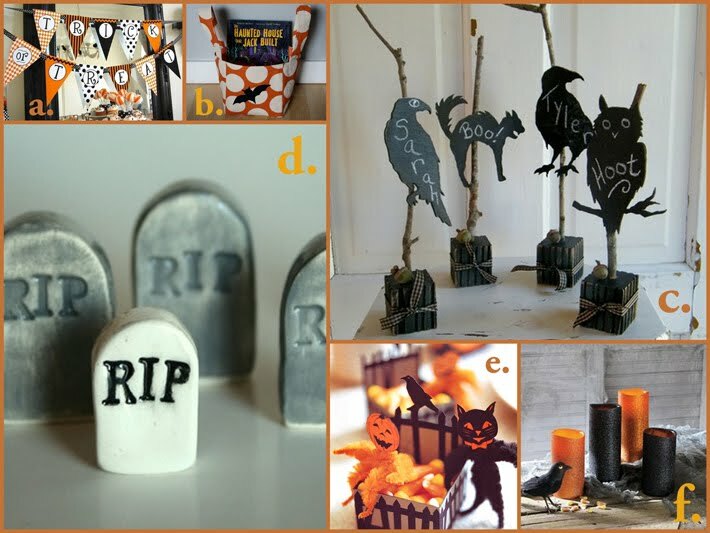 f. These Halloween glittered candles are great because they can be used year after year.